Just last week we put the SLF Motion Hyper Speed System on our Holiday Gift Guide. Well it seems Blake wasn’t satisfied with cage plates made out of 7075 Aluminum as just this morning he has released a new CARBON version along with upgraded Hyper Pulley wheels! The new Hyper Speed System 2.0 has been re-designed from the ground up due to further testing and customer feedback. An overall weight reduction of up to 15% (model dependent) was achieved by utilizing carbon fiber cages (100% USA made) all the while become stiffer and more durable as well. The new V2 Hyper Speed System also now offers multiple spring tension settings and features improved bearing performance as well. Lastly, the entire V2 Hyper Speed System lineup will utilize the same wheel size combination of 14T/18T, a decision based upon the ideal combination of reduced friction, ease of installation/setup, and repeatable precise shifting. All V2 Hyper Speed Systems are now compatible with up to 32T cassettes (some up to 34T). All SLF Motion products are all built by hand in Pawnee IL, sourcing only the best materials and bearings from around the globe. 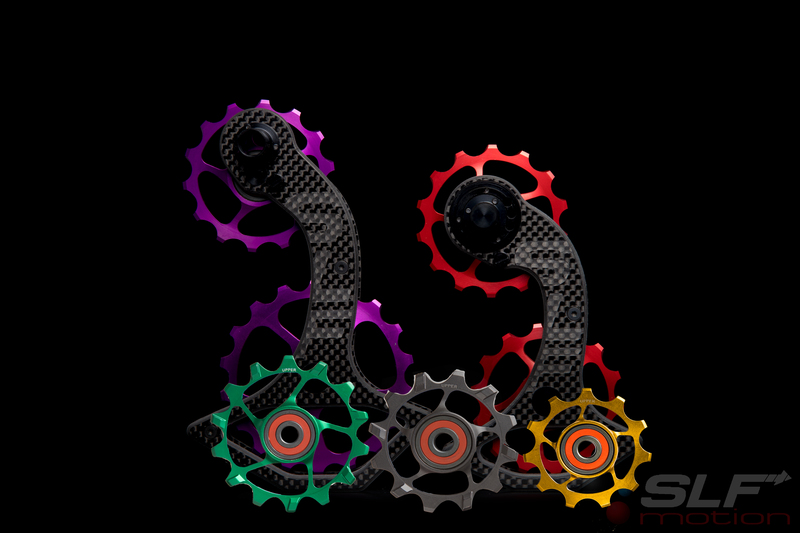 SLF Motion uses hybrid ceramic bearings (Si3N4 ceramic balls with hardened & coated steel races) that exceed current industry standards in order to reduce friction and provide extreme longevity in the harshest of conditions. The company’s longtime staple, their Hyper Pulley Wheels, received a complete redesign as well. The new Hyper Puller Wheels include news sizes, materials, available colors, and updated bearings. Customers looking to buy the latest SLF Motion products can take part in the company’s new Trade-In/Trade-Up program. SLF Motion wanted to figure out a way to thank their loyal customers by offering them a more affordable way to upgrade to the newest offerings. Send in a used set of Hyper Pulley Wheels and receive an $80 credit towards a new set of Hyper Pulley Wheels, a Midsize Hyper Crit System, or an Oversize Hyper Speed System. Send in a used V1 Hyper Speed System and receive a $175 credit towards a new Midsize Hyper Crit System or a V2 Oversize Hyper Speed System. You can preorder all these new products from www.slfmotion.com. Oversized pulley wheel systems and ceramic pulley wheels have become the de facto standard in the pro transition racks and SLF is continuing to challenge the heavy weight stalwarts of the industry. 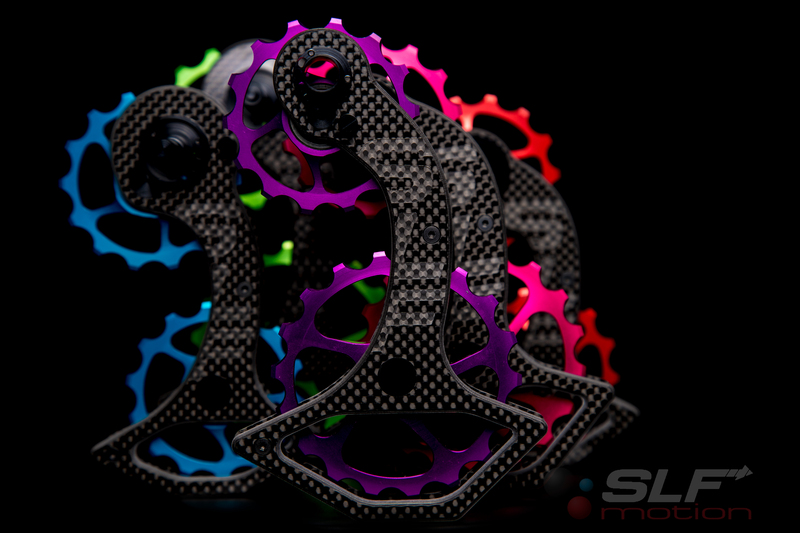 The upgrade to carbon cages is both a win in the weight wars and an upgrade to the bike bling. At $485 the 2.0 system is approaching price points similar to (but still a couple dollars cheaper) their competitors, though we do find this system to have a more aggressive look that we like. We are going to reserve final judgment to we both get a set to spend some time with and see updated independent testing. But for now we do have to congratulate Blake and SLF motion in getting this update out there and are sure we will be seeing these on quite a few pro and AG bikes in Kona!